Chris has taught classroom music in Australia (Prep-Yr 12), New Zealand (Yr 9-13), the USA (Grades K-6) and Samoa (Yr 6-11). He has also taught lessons in piano, voice, trumpet and choral conducting, as well as classroom drama and some dance. Learn more about his Key Tasks & Experience below. Chris currently teaches Music and Religious Education at St. Monica’s College, Cairns, Queensland, where he also conducts HarMonica, the 16 voice choir. He co-conducts the Cairns Gondwana Indigenous Children’s Choir with Lyn Williams and has co-conducted Gondwana Singers at the Gondwana National Choral School in Sydney since January 2014. Before a brief stint teaching Music at Edge Hill State School he was HOD Music & Performing Arts at Waimea College for 10 years from 2002. He taught Year 9-13 Music and conducted Belle a Cappella, the college’s national award-winning chamber choir. He has conducted the concert orchestra, was musical director for the school production “Jesus Christ Superstar”, and established the school’s first Theatre Sports team. Chris has conducted choirs of all ages– from the 90-strong Year 6 Choir at Kingston Elementary School (Plymouth, U.S.A., 1997-98) to Opera North (Whangarei, 2001–guest conductor) to Polyhymnos Chamber Choir at the Nelson School of Music (2002-05). 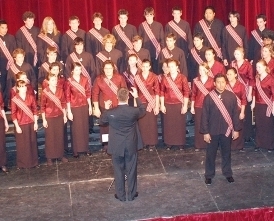 He was Associate Conductor of the New Zealand Secondary Students Choir 2007-08. Chris continues to make himself available to choirs for workshops. He created three custom arrangements for Femme of Southland Girls High School, travelling to Invercargill to workshop the pieces. Femme was invited to perform his works at the Big Sing National Finale choral competition in Wellington in 2008 and Auckland in 2010. For most of his time at Waimea College, Chris was also Head of Sheppard House— winners of House Song 2006 and the House Shield 2009.